Below the pool at the Garden Bar, steps lead down to Limone’s main beaches in less than 3 mins. This beach is the one most used by the Riviera’s guests as it is just below the hotel. After 100 steps you reach the gravelly shore, where you are free to lie down under the shade of fig trees as well as having the possibility to rent umbrellas and sunbeds. It is well equipped with toilets, there is a sailing and kite school, a beach volley field. There is a cozy beach bar just after Leonardo da Vinci’s little harbour where you can have a drink and enjoy the fresh air of the lake shore. This beach is at 2.5 km from the Hotel Riviera and just 5 minutes’ drive. You can park in the vicinity of the Hotel Limonaie and walk down the road until you reach the beach. Here you can find a gravelly beach which has remained unchanged over many years with willows and wild fig trees. There is a beach bar too which also provides warm meals. There is free access to this beach which is just near the promenade on the lake shore. Easy to reach as it is just near the parking in town. There are toilets, you can hire pedalo boats, sunbeds and umbrellas. This beach is nice at night, and can be reached by walking along the San Giovanni stream, which is also a short cut to the city center. 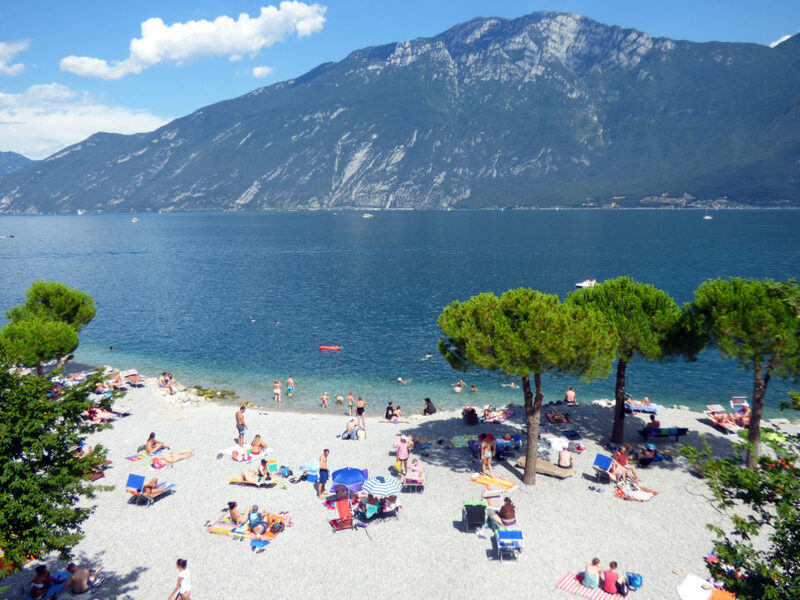 This beach can be reached from the Hotel Limone. Just before the bridge there are stairs that lead straight down to another gravelly beach where you can find a windsurfing school. It is used by many people and is usually very crowded.